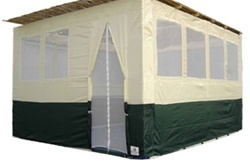 The Sunshine Sukkah is designed exclusively for our warm southern friends. With mesh all around you are assured maximum ventilation. The windows allow airflow through your sukkah and the screens filter the direct sunlight allowing for the most pleasurable yom tov experience. Specifically designed for you in mind for maximum comfort. Combined with convenience & ease of our ease-lock system, installing & storing the sukkah is an absolute snap! Schach Kaynus Mats may be purchased separately here. Classic Sukkah (with or without Schach Mats) Traveling Sukkah 64"x64"
My First Sukkah (Succah) Traveling Sukkah 40"x40"